Are you in? I’m in! Into where you are wondering? Only into the ultimate and most exclusive all white party that has ever taken place…Le Diner en Blanc. I mean all white everything. All white clothes, all white table linens, all white dinnerware, all white decorations, if it isn’t white then it has no place at Diner en Blanc. Some of you may not know what Diner en Blanc actually is. Well let me give you a little history on it. Le Diner en Blanc is the gathering of friends to enjoy a gourmet meal set at a private location against the backdrop of a beautiful city space. Le Diner en Blanc started in 1988 in Paris, France. Almost 30 years later, it has become an international event celebrated on six continents, in over 3o countries and more than 70 cities. Talk about growth! Atlanta is now celebrating it’s 4th year as a part of this international celebration. It is a glorious sight to see waves of people arrive in all white; to take over a small portion of our city and celebrate life. Then they disappear into the night as if they were never there. Take a look at last year’s event here. Exactly! If last year looked that good, then this year can only be better. To be able to pull off something so grand requires a team. Atlanta has a new set of hosts: Helen Mitchell, Lisa Fisher, Tina DeRenzis, all key players in event planning. I am sure they are going to make this an unforgettable event for all involved. This is all done with the help of volunteers and sponsors. This year’s local sponsor is Champagne Lanson and the National sponsor is Evian Badoit. With a team like this, I can’t wait to see what they have in store for everyone. 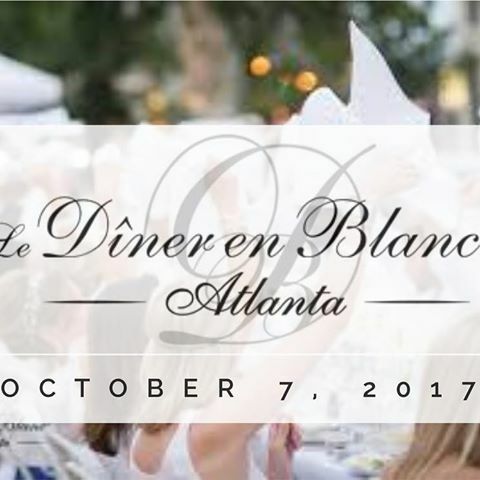 Diner en Blanc Atlanta takes place this weekend, October 7, 2017. I have everything I’ll need. White dress…check. Stand out pearl neck piece…check. Portable charger…check. Desire to share all that makes Le Diner en Blanc Atlanta the place to be seen on all my social media…CHECK! Make sure you’re following me on all social media @TheChefInPearls so you can stay up to date on all things Chef in Pearls and Diner en Blanc Atlanta. I plan to make some serious memories this weekend. I hope you plan to do the same. So go forward and make new memories. Hi my name is TaLisa I am new to Atl and always wanted to be apart of this event.I wanted to see if You can sponsor me for next year?I read that I can ask someone that attended last year to sponsor me. Because I went as media I don not have the same privileges as members. I’m sorry. Reach out through their website to be notified when phase 3 opens up so you can try your hand at getting in that way.